This isn't a real post today, but I just wanted to find out how everyone's Thanksgiving was!! Did you eat a lot?? (What kind of question is that?? DUH!). My family had TWO turkeys, a ham, two kinds of mashed potatoes, stuffing, cranberry, roasted brussel sprouts with butternut squash, pumpkin pie, apple pie, rum cake, cookies and MORE! YUM! I ended up wearing an ombre-ish mani with all OPI fall color polishes. I say ombre-ish because the colors are not quite a perfect ombre, but I loved how they went together! 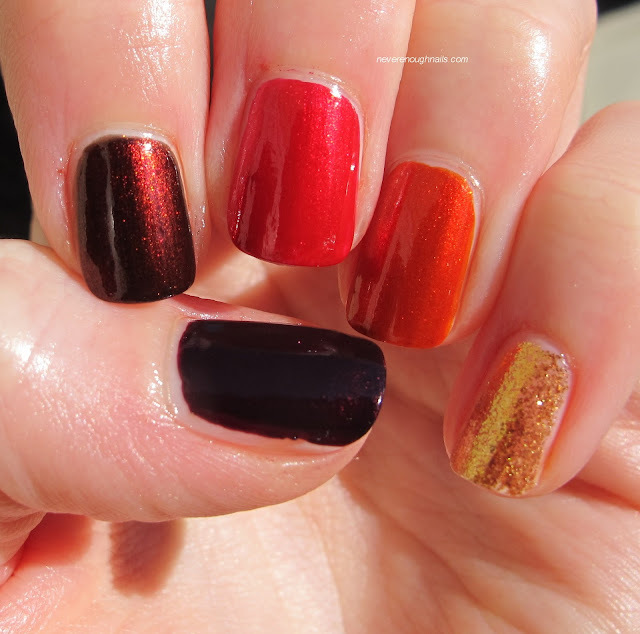 From thumb to pinkie: OPI Black Cherry Chutney, OPI German-icure by OPI, OPI Danke-Shiny Red, OPI Deutsche You Want Me Baby?, and OPI Goldeneye. Who already has the Christmas songs rockin?? Some products sent for review. For more information, please see my Disclosure Policy.